We built da Vinci's Mechanical Lion. 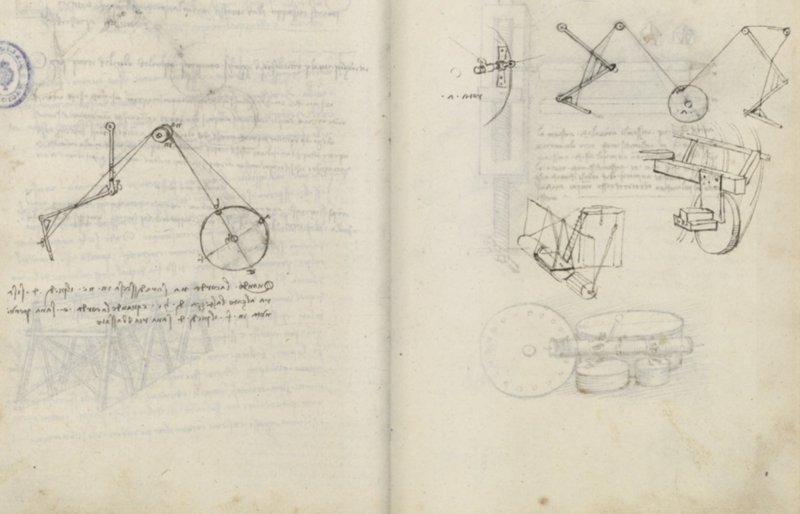 To build a killer mechanical lion as true to da Vinci's original as possible. Unfortunately, he left no explicit sketches. So we had to do a lot of research and improvise where he laid out no instructions to create a fully functional mechanical lion. Leonardo da Vinci left only a rudimentary sketch of his robotic lion, so our team had to rely on a number of other resources. Using both contemporary accounts and other mechanical sketches left by the great artist, we attempted to recreate da Vinci's lion focusing solely on the walking mechanic. Our main resource was Madrid MS I, f. 90 r-v, which can be viewed in its entirety here. Here is the most relevant sketch which is believed to detail the mechanics used to create the legs and walking motion of the lion. Because we didn't have detailed sketches to rely on, we prototyped early and rapidly with everything from hot glue to legos to spare metal. Following our research, we determined a first milestone would be to prototype the leg motion. We started with a few small-scale Lego mockups, but found it most instructive to move to full-size foam core rectangle legs joined by wooden dowels. We hot glued "Franken-Legos" to the legs to provide (1) variable holes for routing the string and (2) variable end stops to transfer motion from one joint to another. The variability of the Legos helped us develop an intuition for how to tune the exact leg motion we wanted. Milestone 2: Double the legs, double the fun! With the leg motion for one side of the lion down, we wanted to add the structure necessary to get all four legs moving at once. Since foam core wasn't sufficiently strong, we moved to a wooden frame made of 2x1 and 4x1 lumber. We originally routed the two strings on the same side of the lion to the same large circular wheel, as they appeared in da Vinci's drawings. This meant that, with each rotation, the two legs on one side would lift up together, then the two legs on the other side, etc. After studying some lion videos online, we quickly realized this is not how lions walk; instead their diagonal front and back legs move as a pair. To achieve this motion, we routed the back leg strings across the body (through a pillow block bearing) so that the each diagonal leg pair could be connected to its own large wheels. This was our first major deviation from the drawings we researched. Our next step was to move our foam core and wood prototype into CAD to prepare for a full wood version. There, we also started adding embellishments like the leg "muscles" and feet. CAD continued to be an integral part of our build process, especially as we began adding many decorative elements on top of the base structure. Basically, the problem there is how the string traverses the distance in the x-direction (x, being width of the lion). Right now, in the prototype we have, the legs are close to each other and the base is slim enough that the solution we had in mind works without problem (the metal hole we glued on the bottom of the base). If we do want to increase the width of the animal a bit to make it more realistic, we could run into problems with our current solution. 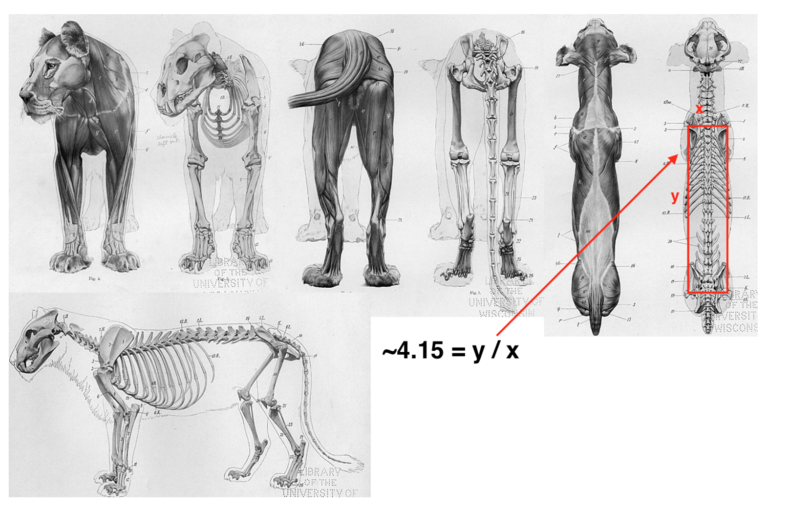 We’ve estimated that the rectangle formed at the points the lion’s feet touch the ground when they are fully extended to have a height:width ratio of around 4.15. Right now, the Onshape assembly has that ratio around 6.2. The problem that would arise is, with one base frame and one hole to cross the string over, the string might run into the bottom edge of the base as it is (look below at the sketch titled 2 for the question marks). Furthermore, the lion would extend in the x-direction a lot without good support (assuming one piece base frame) as we would be increasing the width by making most parts (legs, shoulder pulley/slider) stick out more. Also the main wheel would be in the middle and covering a small width of the lion which could be not balanced, if we don’t the wheel section stick out as well. Instead, of going on with the one piece base frame, we can also switch to a two base frame model, whose width we can manipulate with thicker blocks between them as desired (sketch labeled 2, three blocks in between bases). This would also solve the string crossover as we can use 2 of the metal holes we used at the bottom of each base piece for each string crossing over (so a total of 4 such metal pieces). I believe, overall, things would be easier to install as well since we don’t need to make things stick out any more to gain width. Also, the rod connecting the two shoulders in sketch 2 (and the rod connecting the hips not drawn) could be used later to install the decorative elements on to the base perhaps. Milestone 4: Time to Build! Armed with our CAD design, we began the fabrication process. Our base frame was built of 2x6, 1x2, and 1x4 lumber cut on the bandsaw and drill press. For the large curved frame (shown below on the left), we printed out a 1:1 drawing of the CADed part, glued it to the 2x6 wood, and then bandsaw-ed along the lines. 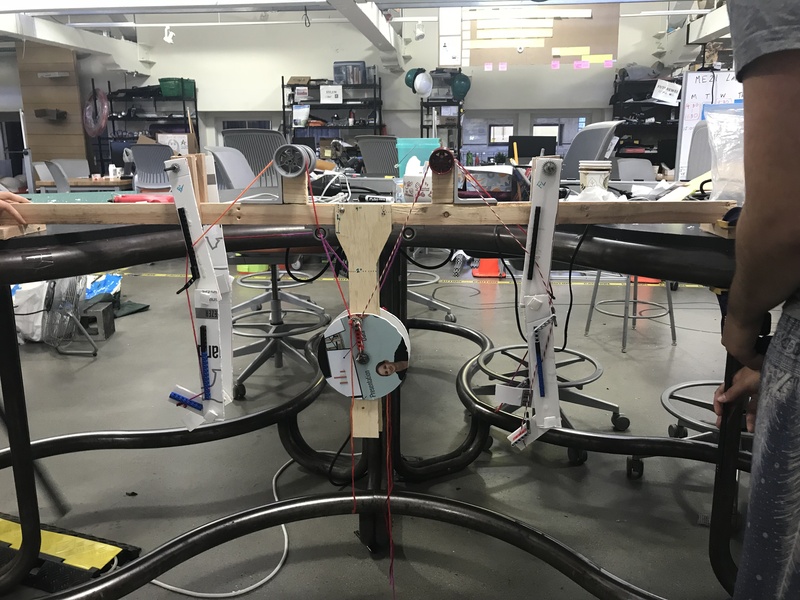 Once the individual frame parts were prepared, we fastened them together with wood screws; at the suggestion of Mark, we predrilled countersunk pilot holes, added some wood glue for extra security, and then put the wood screws in. We also started laser cutting the leg parts from 1/8" plywood (shown below on the right), sanding out the holes for smoother rotation, and wood gluing them together. The lion has three points of contact with the ground: the two large wheels in the middle of its body and the tail in the back. Coupled with our decorative head elements, this led to a very tippy, front-heavy lion. To counter this, we added a 5 lb weight in between the two frames, towards the back of the lion.